University of Ulster economist Professor Neil Gibson has been chosen for a prestigious Eisenhower Fellowship award – the only Northern Ireland person to receive the honour this year. 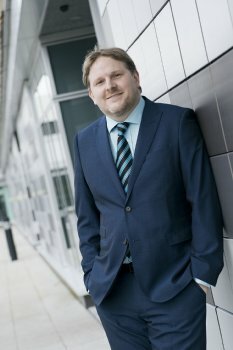 Professor Gibson, Director of the NI Centre for Economic Policy (NICEP) at Ulster, will take part in an intensive seven-week programme in the United States, where he will focus on the role of economics as a dynamic social science and the importance of economic literacy in a world characterised by globalisation, international markets and world-wide competition. “It is an honour to be selected as an Eisenhower Fellow for 2014. I am humbled by the opportunity and look forward to meeting the rest of the Fellows and engaging in an informative and inspiring trip to the US,” he said. “The Northern Ireland economy is in a fragile state – and important decisions will be made in the near future that will determine the prospects of a generation. It is therefore important, as a Professor of Economics, that I develop the skills to play a role in helping the region make the right choices. Being part of a global fellowship committed to President Eisenhower’s vision of promoting prosperity and peace, will be invaluable in helping me to do this. Unique among international professional and leadership development programmes, the Fellowships are individually designed to reflect the particular professional interests and commitments of each participant. Now in existence for 60 years, the international leader exchange programme was established to celebrate President Dwight D Eisenhower’s first birthday in the White House. Eisenhower Fellowships provide professional enrichment, leadership development and an opportunity to expand professional networks. Professor Gibson will engage in a series of meetings with key stakeholders to gain a broad perspective of economic trends in the US, exchange ideas with leading professional peers and gain insights into managing change in the field of economics. His learning experience in the US will shape NICEP’s work in informing policy and will contribute to the teaching of economics within the University and the development of its curriculum. Eisenhower Fellowships (EF) is a non-partisan, not-for-profit organisation founded in 1953. The programme provides professional enrichment, leadership development and network expansion. Fellows have an opportunity to take time out from their occupations to meet leaders and senior experts in their field, enhance their leadership skills, and become part of a global network.